I’ve previously written some in-depth guides for two of the DAWs I’ve used: FL Studio and Pro Tools. Recently, I decided to write a more general guide for finding the best laptop for making music. This guide will suit all popular DAWs (including the 2 I mentioned, Ableton, Logic Pro, Reason, Reaper, Studio One and so on). In this guide, I’ll show what I search when looking for the best laptop for making music and what are the best laptops for making music right now. What are the requirements for the best laptop for making music? I’ll start off with showing you what you need to look for EXACTLY to identify the best laptop for making music. But don’t worry, at the end of the article, I’ll cover which laptops match these requirements the closest for every price tag. The processor is by far the most important spec for making music. That makes single core performance is the most important metric. Of course, having more cores is always good, but music production is not equally balanced between CPU cores. This results in one core being the “performance bottleneck”. Usually, it is the core handling the master chain. Name’s first digit 4 or above? Is the second digit 7 or above? A few notable exceptions are i7-5500U, i7-6500U, i7-6600U (if you need a good battery life) and i5-6300HQ (if you are on a tight budget). Sadly, AMD does not CPUs that can compete with top Intel models so we’ll not consider them. RAM size for making music? A good laptop for making music needs to have at least 8 GB of RAM. But I would strongly encourage you to look for 16 GB if you can spend $850 or more. Should you get SSD or HDD for making music? 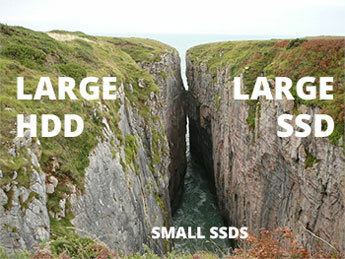 Straight out the bat, you’ll face the dilemma of choosing between a small SSD and a large HDD. But don’t worry, if you desperately want an SSD – you can get it at a much lower price. At the same time, you’ll need to give up some other specs as battery life, screen quality or memory size. Of course, we’ll not even consider sacrificing processor speed for an SSD. If you need a laptop that you could use in live sets – you should prefer a lightweight or at least a laptop of an average weight. Without a doubt, a good screen is a great addition to any laptop. In our case, we don’t really care about color gamut/coverage and contrast. These are nice additions but I wouldn’t sacrifice other “harder” specs for a slightly better contrast ratio or 10% of sRGB. Resolution – 4K (or QHD, UHD) resolution is a great addition to a music making laptop. Though, depending on your DAW you might need to reduce the resolution as some applications do not properly support HiDPI displays. This is not a critical requirement but if you’re looking for a 15″ or 17″ laptop – a high-resolution display will let you see a lot more of the track at a time. Panel – look for an IPS panel. There are a few other similar panels usually identified as “Wide Angle” panels. You could look for AHVA, PLS or eDP (though technically that’s not a panel type). All of these usually mean it’s a display that doesn’t look distorted when looking from the side. Brightness – this metric is not easy to find. I wouldn’t blame you for ignoring it when searching for the best laptop for music making. But since I’m writing the best guide out there – I’ll have to consider it just to make sure you’re not getting a crappy poorly lit display. I’ll look for screens that can go up to average brightness of 300 cd/sq. m.
Nowadays, Digital Audio Workstations are getting better at handling the touchscreen interface. That’s great if you want to play with some drum loops. At the same time, I doubt touchscreens will replace the physical devices anytime soon but it’s a nice addition nevertheless. Unfortunately, the power behind graphics cards is still not properly leveraged for music making. There are only a handful plugins that can use technologies that can take advantage of Nvidia/AMD graphics cards. I remember trying out an impulse response reverb plugin (old version of Reverberate) that should be able to use the Nvidia graphics card but with no success. I’ve analysed my spreadsheets with over 200 laptops and narrowed down to 5 best laptops for making music. I’ll present them starting from the cheapest and end with the absolute best models. Don’t be fooled by the price of this HP Pavilion notebook. It has a top of the line processor that you would usually find in $1000 laptops. The most surprising thing is that it is not that bad in other aspects. Yes, it doesn’t have a great screen if I’d compare it with Surface Pro, Razer Blade Stealth, Dell XPS or Google Pixel. But considering its price – HP Pavilion has a surprisingly decent display. It has an IPS panel and Full HD resolution plus a touchscreen surface. Not bad. There is no solid state drive. And the battery life is exactly what you’d expect from a laptop packing that much power – 4 hours 30 minutes. If you just need a powerful laptop that can handle music production at a low price – this is a great option. The next laptop I’m going to cover costs $1,280. But if you can’t go above $1000 – I just have to mention MSI GL62 6QF. The next laptop on this list offers the same top rated processor, twice the memory (16 GB) and a lot of space for your plugins and samples. Battery runtime is kind of s*** but compromises had to be made. This relatively unknown brand has built a serious gaming machine at an affordable price. Due to its top shelf components, it is a great machine for music production. This model is a no-brainer if you want 1 TB SSD built-in – these models are hard to come by. It showcases a Full HD resolution in 14-inch display and an IPS panel that you would expect at this price point. I have to mention its high-end Nvidia GeForce GTX 970M video card second only to GTX 980M. But there’s one huge drawback which explains how Eluktronics squeezed in that much power into a small 14″ frame. I’m talking about its abysmal battery life. I wouldn’t recommend it to anyone who wants a laptop to compose or mix on the go. Rather, I’d recommend it to those that are OK with the carry-and-plug-in approach. If you’d rather buy a 15.6″ laptop and you’re not OK with the 1 hour of battery time Eluktronics model can offer, you should consider this MSI gaming rig. MSI GS60 Ghost Pro 4K has the same cream of the crop hardware that you would expect – i7 5700HQ CPU, 970M GPU, and 16 GB RAM. When it comes to storage, you’ll need to split your plugins and samples between its main 250 GB and 1 TB HDD. 4K in its name, obviously, stands for the 4K resolution which can be used to some extent as it’s a 15.6″ laptop. Gaming notebooks are one of the best picks when it comes to best laptops for making music. Usually, they’re fast, upgradable and they come better cooling systems than ultrabooks. If you want a classic gaming machine for making music – MSI GS60 Ghost Pro might be your best bet. What did you expect? Apple laptops are a popular option among producers. I’ve watched enough Tomorrowland sets and Avicii streams to know that close to half of professional producers and DJs use MacBooks. Or at least, they use MacBooks when they’re forced to use a laptop. Compared with other laptops, Apple MacBooks cost significantly more and come only in a few options. But if you need exactly what a MacBook Pro can offer – you might not find a better deal out there. The reason MacBooks cost more than most Windows laptops is that Apple doesn’t cut many corners in their products. In contrast, I could get a PC laptop with a similar performance to a MacBook Pro by ignoring battery life, weight and, to some extent, build quality. But if I need a full package – great performance with good battery life in a sleek chassis – MacBook might just be your best laptop for making music. It comes with an IPS Retina display, an above-average battery life of 7 hours (expect ~3 hours when making beats). The only drawbacks of a MacBook are limited upgradability and only 500 GB of storage space. Don’t get me wrong, that can be plenty for many. But some of us know how fast WAV files can fill up a hard drive. There are options – upgrading it to 1 TB (which would break the warranty) or getting an external hard drive over USB 3.0. Now, that you know how to find the best laptop for making music and which models are hot for that right now – it’s time to make your choice. It’s a great feeling to open a DAW project from an old computer in a new laptop and seeing how much you can push it. Finally, If you know who’d find this guide helpful – please share it with them. And if you have any personal recommendations for a laptop don’t shy away from dropping a comment down below!